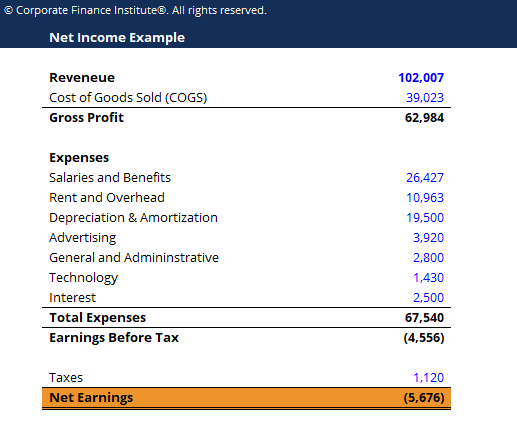 This net income template shows you the calculation of net income using line items from an income statement. Net income is the amount of accounting profit a company has left over after paying off all its expenses. Net income is found by taking sales revenueSales RevenueSales revenue is the starting point of the income statement. Sales or revenue is the money earned from the company providing its goods or services, income and subtracting COGS, SG&ASG&ASG&A includes all non-production expenses incurred by a company in any given period. This includes expenses such as rent, advertising, marketing, accounting, litigation, travel, meals, management salaries, bonuses, and more. On occasion, it may also include depreciation expense, depreciation, and amortization, interest expenseInterest ExpenseInterest expense arises out of a company that finances through debt or capital leases. Interest is found in the income statement, but can also be calculated through the debt schedule. The schedule should outline all the major pieces of debt a company has on its balance sheet, and calculate interest by multiplying the, taxes and any other expenses. Net income is the last line item on the income statement proper. Some income statements, however, will have a separate section at the bottom reconciling beginning retained earningsRetained EarningsThe Retained Earnings formula represents all accumulated net income netted by all dividends paid to shareholders. Retained Earnings are part of equity on the balance sheet and represent the portion of the business’s profits that are not distributed as dividends to shareholders but instead are reserved for reinvestment with ending retained earnings through net income and dividendsDividend Per Share (DPS)Dividend per share is the total amount of dividend attributed to each share outstanding. The formula is total dividends / shares outstanding or earnings per share x dividend payout ratio. Calculating the DPS allows an investor to determine how much income from the company. The net income is very important in that it is a central line item to all three financial statementsThree Financial StatementsThe three financial statements are the income statement, the balance sheet, and the statement of cash flows. These three core statements are intricately linked to each other and this guide will explain how they all fit together. By following the steps below you'll be able to connect the three statements on your own.. While it is arrived at through the income statement, the net profit is also used in both the balance sheetBalance SheetThe balance sheet is one of the three fundamental financial statements. These statements are key to both financial modeling and accounting. The balance sheet displays the company’s total assets, and how these assets are financed, through either debt or equity. Assets = Liabilities + Equity and the cash flow statementCash Flow Statement​A Cash Flow Statement (officially called the Statement of Cash Flows) contains information on how much cash a company has generated and used during a given period. It contains 3 sections: cash from operations, cash from investing and cash from financing.. Assuming there is no dividends, the change in retained earnings between periods should equally the net earnings in those periods. If there is no mention of dividends in the financial statements, but the change in retained earnings does not equal net profit, then it’s safe to assume that the difference was paid out in dividends.